What do Charlie Brown, penguins, and Superman have in common? This question was posed to us last week by Markus Weise, the coach of the German hockey team, in our series of motivational speeches for managers. 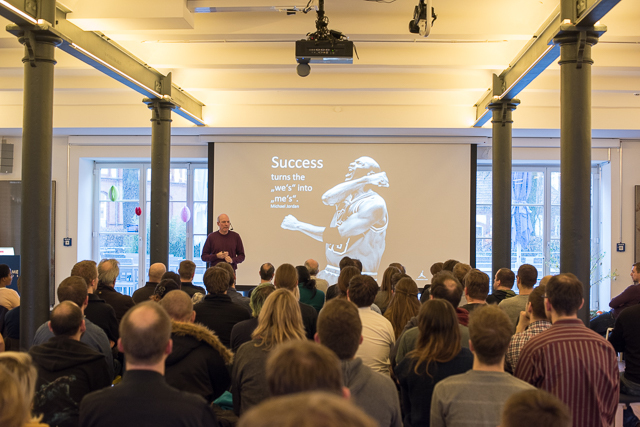 In his brief yet informative talk, Markus explained to us what tactics or maneuvers are necessary to winning a match, and how this relates to leading a successful company. More important than keeping your sights set on the results – “We want to win gold!” – is focusing on your actions – “We have to make this goal!”. In order to achieve our goals at Goodgame Studios, we have seven separate teams assigned to the different game genres we are developing. Each of these teams has fixed objectives to achieve within their field of responsibility, and those are what they focus on. Markus used a video analysis of scenes from hockey matches, illustrating for us what a penguin is, how to recognize a Charlie Brown, and how their weaknesses can be turned into strengths. The term penguin comes from ice hockey and refers to a player who “flaps” his arms while complaining to the referee about a call he considered unfair. Since this distracts the referee and player from the game, the opposing team is given a great opportunity to take advantage of the situation. It is therefore important not to get caught up in trivial matters but rather to always stay focused on the big picture. Markus also explained how, in the right situations, you can make a Charlie Brown, whose main goal is not to look bad from a mistake, into a Superman. In this case, praise and recognition are just as essential as a culture of positive debate. We’d like to thank our staff development team for providing us with yet another informational and beneficial talk, and we’re already looking forward to the next one!